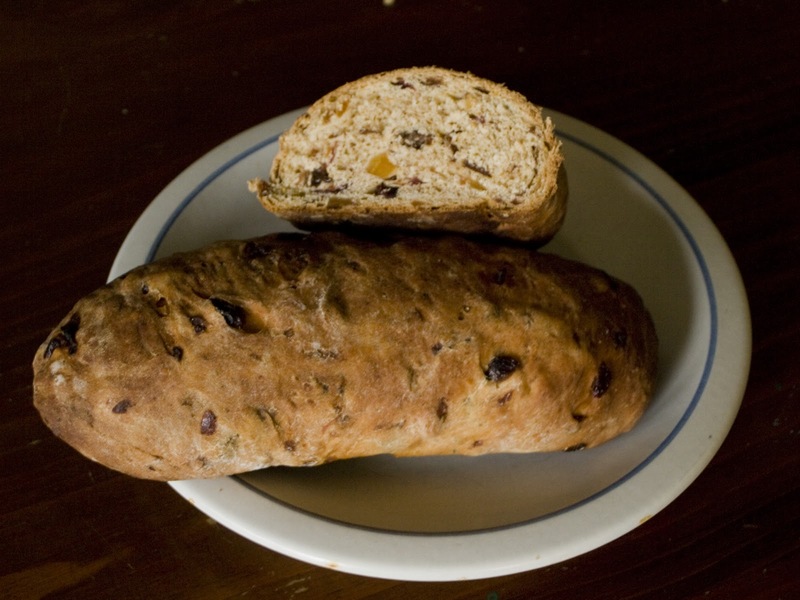 Growing up, I always new it was Christmas time when I smelled Stollen baking in my grandmother's kitchen. It wasn't everyone's favorite holiday treat, but there was something to that fragrant bread that I always loved. My version of this holiday treat is different from my grandmother's mostly because I use dried fruit soaked in Grand Mariner instead of the candied fruit. Soak the chopped up fruit in the liquor for at least two days. Warm the milk to 100° F, then whisk in the flour and yeast, cover in plastic wrap and store for 1 hour in a warm draft free place until very foamy. Mix together flour, sugar, salt, zests, and cinnamon. Fold in sponge, egg and butter. Then add enough water to make a soft dough. Let rest 10 minutes. Add fruit to the dough. Sprinkle the counter with flour and then knead until the fruit is spread evenly through the dough. The dough should not be sticky but may be tacky. Knead for about 6 minutes. Add a bit of oil to a large bowl and spread it around. Roll the dough ball in the oil, cover the bowl with plastic wrap and let ferment for 45 minutes. The dough does not rise much. Form either one large loaf or two small ones. My grandmother always made stollen in metal loaf pans. I formed the dough into two small bâtards. Gently coat with a very thin layer of oil, cover with plastic wrap and proof on a parchment lined sheet pan for approximately 1 hour or until 1 ½ times its size. Heat the oven to 350°F. Bake the bread for 20 minutes, turn the pan and bake for another 20-40 minutes depending on how you made the loaves. Now I don’t do this, but after you bake the loaves and remove them from the oven, coat the loaves with a bit of oil and then cover with powdered sugar, wait a little bit and then tap on another layer. This is apparently traditional, but it was not the way my grandmother made it. Cool completely and store in a plastic bag, unless you like your stollen stale, then leave it out. Stale stollen is also traditional. If you cannot wait to eat your fresh baked stollen, make sure you wait at least 1 hour.